This is a common question in most households across the country. However, for some homebound Blair County senior citizens, purchasing and preparing a nutritious meal is not an option. The Home Delivered Meals Program, operated by Blair Senior Services, Inc., helps to combat food insecurity issues for eligible senior citizens by delivering hot and wholesome meals. Over 600 meals are prepared and distributed per delivery day in Blair County, which totals more than 145,000 meals each year. Consumers receive home delivered meals for various reasons. For some, meal delivery is short-term; they may be recuperating from an operation or medical condition that does not permit them to prepare a meal for themselves. Home Delivered Meals consumers will receive a hot meal on Monday, Wednesday and Friday of each week, along with a frozen meal for use on Tuesday and Thursday. 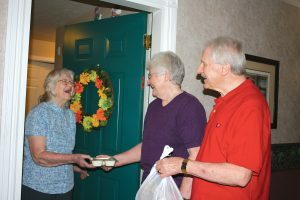 “Blair Senior Services’ dedicated volunteers deliver meals three days a week. Our volunteers not only deliver a nutritional meal to our homebound consumers, but also provide a regular check in on their safety and well-being,” explains Amy Graham, Home Delivered Meals Coordinator. Home Delivered Meals are not only delivered to residents within the city limits, but to those living in rural areas of Blair County. In our more rural areas, church groups will often deliver meals to consumers in their community. Several churches volunteer to deliver meals one week per month. This makes an immediate impact on the homebound residents in their community. If you are interested in becoming a volunteer for the Home Delivered Meals Program, please contact Blair Senior Services, Inc. at (814) 946-1235 or visit www.blairsenior.org.